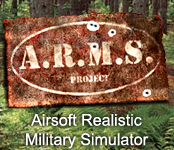 ComBat Games is a tactical event management system allowing to organize high quality military simulation games in airsoft, paintball, lazertag, etc. It is a simplified copy of military Battle Management System focused on civilian sport sector. This software assists in managing all three stages of tactical event organization: event preparation, event processing, event post-processing and analysis. 1) Create, manage and distribute digital game range maps to customers automatically from server to their personal phone or tablet navigator. 2) Declare and describe new tactical events for public, including text description and media content presentation, using special designed Web-portal. 3) View future events calendar and register own participant team on the event for preferred fraction. 4) Discuss future event between participants of each fraction in forum-like style. 5) Prepare mission plans, routes and tasks for every fraction on digital map and display them to participants during event processing in any suitable time and in any order without requirement of visual meeting with each participant. 1) Display location and status of each participant of each fraction on the digital map to event master and location of current fraction participants to each other using GPS receivers in their personal phones or tablets. 2) Display current mission task and route for every fraction participant on the digital map. 3) Improve participants navigation and coordination on the game area. 4) Correct the game-play in the real-time using information about each participant location and current mission status even with small number of participant on extremely big game area. 5) Allow participants to exchange tactical symbols with each other during event in real-time to improve coordination during mission execution. 6) Exchange chat messages and attached media files between participants. 7) Geo-fencing script engine allows to program interaction of every participant with real world areas, counting game points based on territory control, enabling next mission visibility automatically, show warnings about exiting permitted event territory etc. 1) Review after-action replay of every fraction and analyze the reasons of your fraction win or loose. Solve in-game conflicts between participants based on after action replay. 2) Say thanks to game masters and other participants in forum-like style. Share event photos. 3) Send private messages to other team leaders and invite them to the next event. All you need to start is register on this Web-site, download Android application, create your team and join any nearest event. Detailed instructions can be found in downloads section.